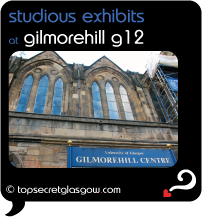 ... so do you want to know what's keeping those 'in-the-know' folks talking about Gilmorehill G12? It's... how modern and clean the lines are, inside Gilmorehill G12. From the outside, the building is certainly Victorian. But inside, it suits its purpose to perfection, which is lovely, and just right, too! Enjoy! Now... don't tell anyone else. And DO NOT reveal this Gilmorehill G12 top secret file and password. We'll know.... And we'll track you down and tie old tin cans to your car bumpers! And get yourself onto the VIP list below while it's still open, and I'll drop you a short email every time we reveal something new about Gilmorehill G12. for a Scottish meal before or after your movie or cultural exhibit here is... and we love it because they ooze easy style and charm. And the food they serve with such grace makes new fans every day, with us amongst them! How long will you be able to resist their gorgeous meals, followed by those exquisite puddings? And remember you can grab your own page here to share your tips, photos and stories about Gilmorehill G12. Have fun! Great news! Finding this page means you can now join our VIP list for Gilmorehill G12. You found the Top Secret File for Gilmorehill G12. If you don't have a password yet, there are still lots of great things about Gilmorehill G12 in its Buzz Page. ("The Buzz" page is also the place to pick-up the password by taking part).